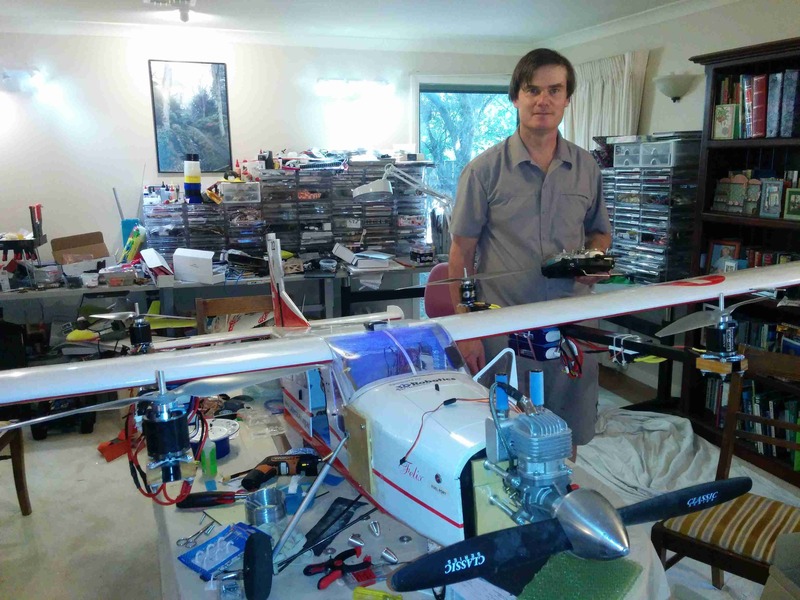 As part of our efforts in developing aircraft for the Outback Challenge 2016 competition CanberraUAV has been building both large helicopters and large QuadPlanes. The competition calls for a fast, long range VTOL aircraft, and those two airframe types are the obvious contenders. This particular QuadPlane was the first that we've built that is of the size and endurance that we thought it would easily handle the OBC mission. We based it on the aircraft we used to win the OBC'2014 competition, a 2.7m wingspan VQ Porter with a 35cc DLE35 petrol engine. This is the type of aircraft you commonly see at RC flying clubs for people who want to fly larger scale civilian aircraft. It flies well and the fuselage and is easy to work on with plenty of room for additional payloads. The base airframe has a typical takeoff weight of a bit over 7kg. In the configuration we used in the 2014 competition it weighed over 11kg as we had a lot of extra equipment onboard like long range radios, the bottle drop system and onboard computers, plus lots of fuel. When rebuilt as a QuadPlane it weighed around 15kg, which is really stretching the base airframe to close to its limits. To convert the porter to a QuadPlane we started by glueing 300x100 1mm thick carbon fibre sheets to the under-surface of the wings, and added 800x20x20 square section carbon fibre tubes as motor arms. This basic design was inspired by what Sander did for his QuadRanger build. in the above image you can see the CF sheet and the CF tubes being glued to the wing. We used silicon sealant between the sheet and the wing, and epoxy for gluing the two 800mm tubes together and attaching them to the wing. This worked really well and we will be using it again. They are held on using velcro and cup-hooks epoxied to the CF sheet and spars, with rubber bands for securing them. That works really well and we will also be using it again. 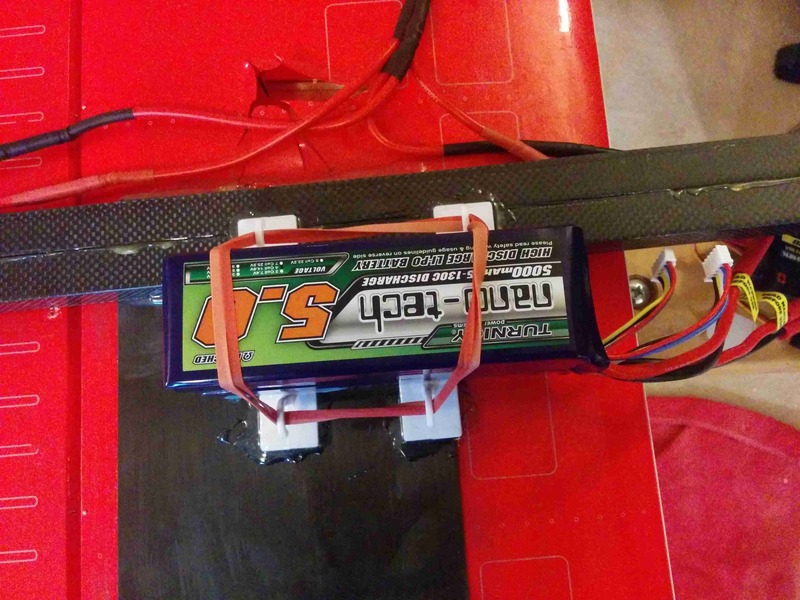 The reason for the change to wing mounted batteries is twofold. 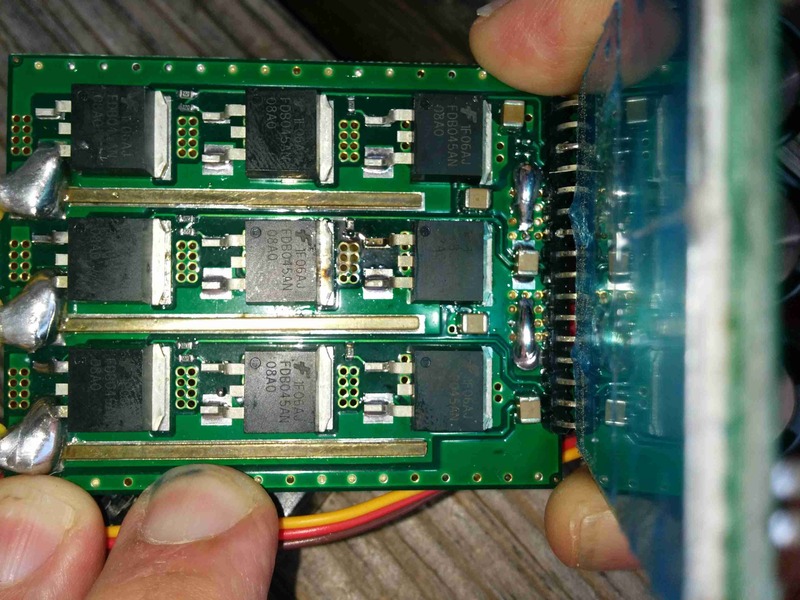 The first is concerns of induction on the long wires needed in such a big plane leading to the ESCs being damaged (see for example http://www.rcgroups.com/forums/showthread.php?t=952523&highligh...). The second is that we think the weight being out on the wings will reduce the stress on the wing root when doing turns in fixed wing mode. 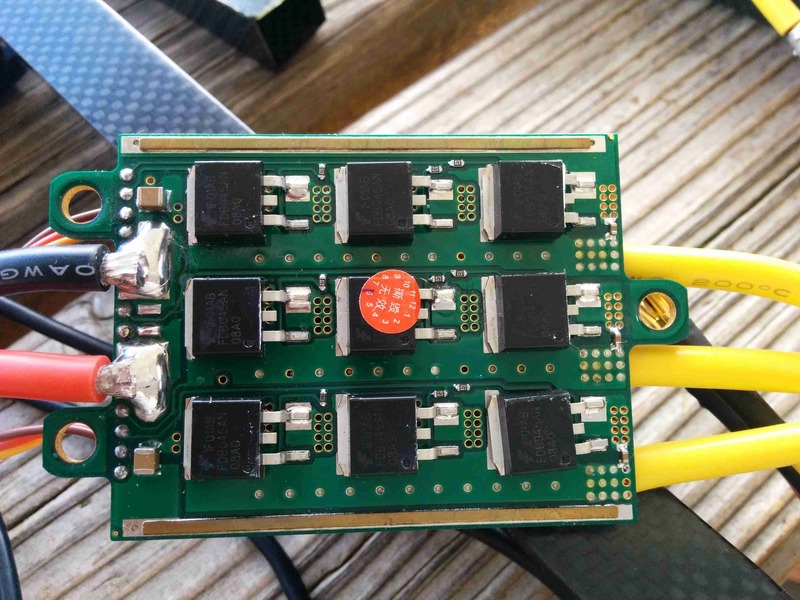 We used 4S 5Ah 65C batteries in a 2S 2P arrangement, giving us 10Ah of 8S in total to the ESCs. We didn't cross-couple the batteries between left and right side, although we may do so in future builds. For quad motors we used NTM Prop Drive 50-60 motors at 380kV. That is overkill really, but we wanted this plane to stay steady while hovering 25 knot winds, and for that you need a pretty high power to weight ratio to overcome the wind on the big wings. It certainly worked, flying this 15kg QuadPlane did not feel cumbersome at all. The plane responded very quickly to the sticks despite its size. We wired it with 10AWG wire, which helped keep the voltage drop down, and tried to keep the battery cables short. Soldering lots of 10AWG connectors is a pain, but worth it. We mostly used 4mm bullets, with some HXT-4mm for the battery connectors. The Y connections needed to split the 8S across two ESCs was done with direct spliced solder connections. For the ESCs we used RotorStar 120A HV. It seemed a good choice as it had plenty of headroom over the expected 30A hover current per motor, and 75A full throttle current. This ESC was our only major regret in the build, for reasons which will become clear later. For props we used APC 18x5.5 propellers, largely because they are quite cheap and are big enough to be efficient, while not being too unwieldy in the build. 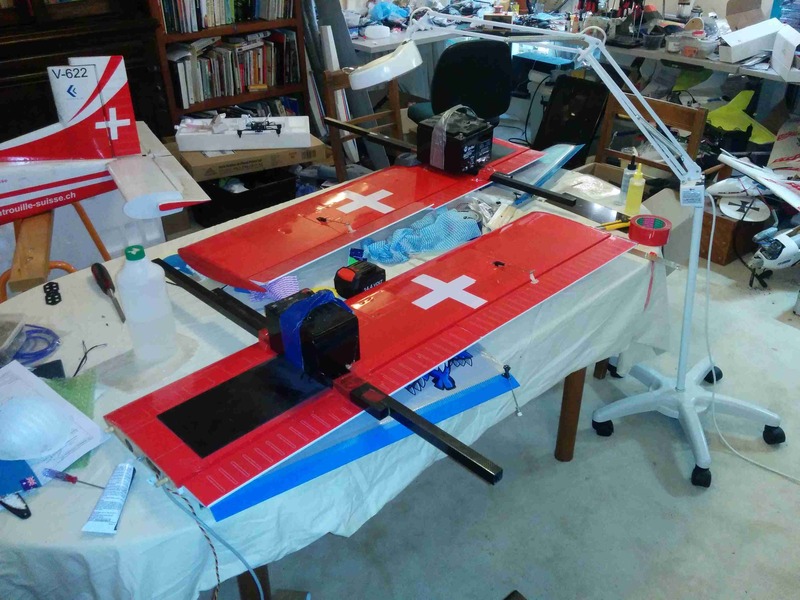 For fixed wing flight we didn't change anything over the setup we used for OBC'2014, apart from losing the ability to use the flaps due to the position of the quad arms. A VTOL aircraft doesn't really need flaps though, so it was no big loss. We expected the 35cc petrol engine would pull the plane along fine with our usual 20x10 prop. We did reduce the maximum bank angle allowed in fixed wing flight, down from 55 degrees to 45 degrees. The aim was to keep the wing loading in reasonable limits in turns given we were pushing the airframe well beyond the normal flying weight. This worked out really well, with no signs of stress during fixed wing flight. The first test flight went fine. It was just a short hover test, with a nervous pilot (me!) at the sticks. I hadn't flown such a big quadcopter before (it is 15kg takeoff weight) and I muffed up the landing when I realised I should try and land off the runway to keep out of the way of other aircraft using the strip. I tried to reposition a few feet while landing and it landed heavier than it should have. No damage to anything except my pride. The logs showed it was flying perfectly. Our initial guess of 0.5 for roll and pitch gains worked great, with the desired and achieved attitude matching far better than I ever expected to see in an aircraft of this type. The feel on the sticks was great too - it really responded well. That is what comes from having 10kW of power in an aircraft. The build was meant to have a sustained hover time of around 4 minutes (using ecalc), and the battery we actually used for the flight showed we were doing a fair bit better than we predicted. A QuadPlane doesn't need much hover time. For a one hour mission for OBC'2016 we reckon we need less than 2 minutes of VTOL flight, so 4 minutes is lots of safety margin. Unfortunately the second test flight didn't go so well. It started off perfectly, with a great vertical takeoff, and a perfect transition to forward flight as the petrol engine engaged. The plane was then flown for a bit in FBWA mode, and it responded beautifully. After that we switched to full auto and it flew the mission without any problems. It did run the throttle on the petrol engine at almost full throttle the entire time, as we were aiming for 28m/s and it was struggling a bit with the drag of the quad motors and the extra weight, but the tuning was great and we were already celebrating as we started the landing run. The transition back to hover mode also went really well, with none of the issues we thought we might have had. Then during the descent for landing the rear left motor stopped, and we once again proved that a quadcopter doesn't fly well on 3 motors. 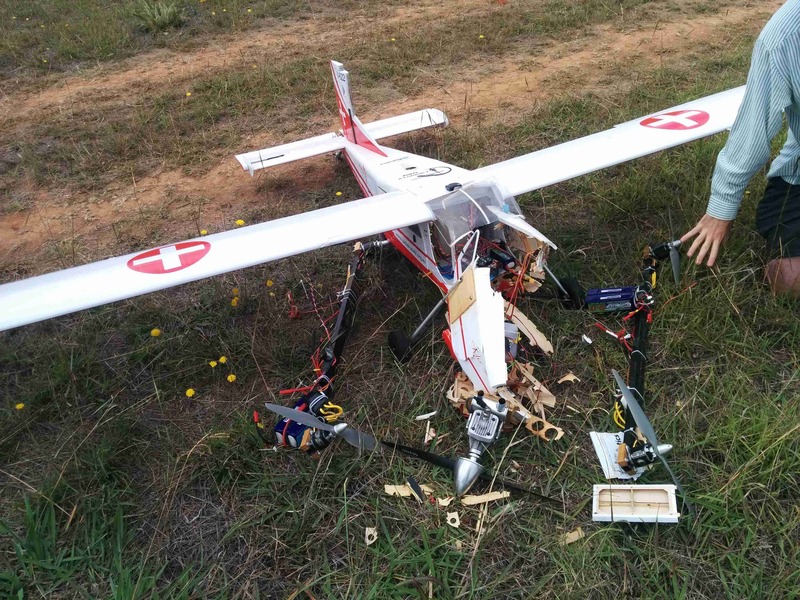 Unfortunately there wasn't time to switch back to fixed wing flight and the plane came down hard nose first. Rather a sad moment for the CanberraUAV team as this was the aircraft that had won the OBC for us in 2014. It was hard to see it in so many pieces. that red quality control sticker is placed over the FET on the other side of the board from the dead one, and the design of the ESC is such that the heat from the dead FET has to travel via that covered FET to the heatsink. The sticker was between the FET and the heatsink, preventing heat from getting out. All we can say for certain is the ESC failed though, so of course we started to think about motor redundancy. We're building two more large QuadPlanes now, one of them based on an OctaQuad design, in an X8 configuration with the same base airframe (a spare VQ Porter 2.7m that we had built for OBC'2014). The ArduPilot QuadPlane code already supports octa configs (along with hexa and several others). For this build we're using T-Motor MT3520-11 400kV motors, and will probably use t-motor ESCs. We will also still use the 18x5.5 props, just more of them! Strangely enough, the better power to weight ratio of the t-motor motors means the new octa X8 build will be a bit lighter than the quad build. We're hoping it will come in at around 13.7kg, which will help reduce the load on the forward motor for fixed wing flight. Many thanks to everyone involved in building this plane, and especially to Grant Morphett for all his building work and Jack Pittar for lots of good advice. Building and flying a large QuadPlane has been a lot of fun, and we've learnt a lot. I hope to do a blog post of a more successful flight of our next QuadPlane creation soon! Thank you for taking the time to describe your story in such detail. After reading the details of all your painstaking efforts to build so carefully, seeing that photo of the Porter's carcass was a bit nauseating. I certainly know that moment of helpless horror when control is lost. I appreciate the story's sick irony that the root cause of failure may have been a sticker assuring product reliability. I've been leaning towards a tricopter VTOL configuration to avoid the extra weight and drag of an extra motor/prop. I didn't consider rotor redundancy so important when only operating as a copter for 5% of the flight time. Now I'll think again! Very interesting that you doubled your rotors and saved weight?! I don't understand how the T-Motor's power:weight ratio could be so much higher, that it's lighter after doubling the ESCs, props, and motors? Did you loose a bunch of excess thrust in the trade? It sounds like your gas engine was reaching its limit with all the excess drag, I wonder if 4 more props will require a bigger engine, more weight, more fuel. I also wonder if it would be worthwhile to stop the copter props parallel to the fuselage during forward flight. There must be some way to program an ESC to do this? If not, I've heard of people using a small servo that extends a flexible plastic stick in the props a few secs after the throttle is set to zero, and immediately retracts when power is added. This was used to avoid prop strikes on landing without a folding prop. Not sure if the drag savings would be worth the trouble, but it might on a long mission like yours. Thanks again for your continued generosity with all of us you haven't even met. Congratulations for the amazing development! It is really inspiring! Just a question (I hope it helps) When transitioning: Do you control heading or heading rate? @DBX, its rate controlled. I originally coded it as heading controlled during the transition in an auto-landing, but pretty quickly found in simulation tests with a strong cross wind that the aircraft could become quite unstable. It was far better to allow the plane to naturally weathervane as it wanted to. So now all transitions are rate controlled, allowing for weathervaning. Good luck for the next quadplane tests! @Andrew Tridgell Amazingly well executed. It is far better to do what you said. I thought it was motors saturation in the video due to yaw channel saturation. If it is yaw rate controlled: Why was it having yaw-roll coupled perturbations then? @DBX, the transition before the crash was under pilot control. The pilot switched to QHOVER mode and let the plane naturally come to a stop, then the pilot started backing up a bit to get to a better landing point. The backing up wasn't perfect, but the logs show the plane was doing what was requested of it until the rear left engine failed. After that it tried desperately to retain stability but didn't have a chance. @Andrew Wow, that is what pioneering has. Congratulations! That's a very nice build, too bad it failed on the ESC. But it's nice to know quadplanes perform well, even when you scale them up. It's nice to have been of help with my QuadRanger build log. that red quality control sticker is placed over the FET on the other side of the board from the dead one, and the design of the ESC is such that the heat from the dead FET has to travel via that covered FET to the heatsink. The sticker was between the FET and the heatsink, preventing heat from getting out." I buy tens of IR controlled RGB LED PWM controllers with burn out FET. Building 50V solar panel chargers I use Step-Down DC/DC converter and current is limited to 2A, increased to 3A when radiator is affixed to FET. I didn't notice the heatsink on the images but why not to glue individual radiators and let free air flow to cool radiators down or use fan to support enforced cooling ? Ok, QC sticker is manufacturer's fault, so you can easily get money back claiming damages. Please attach image of heatsink. DJI is using power draw limit on Li-Po batteries not to burn them but I still see no temperature sensor built-in by default into Li-Po battery packs to prevent overcharging and heavy power draw.